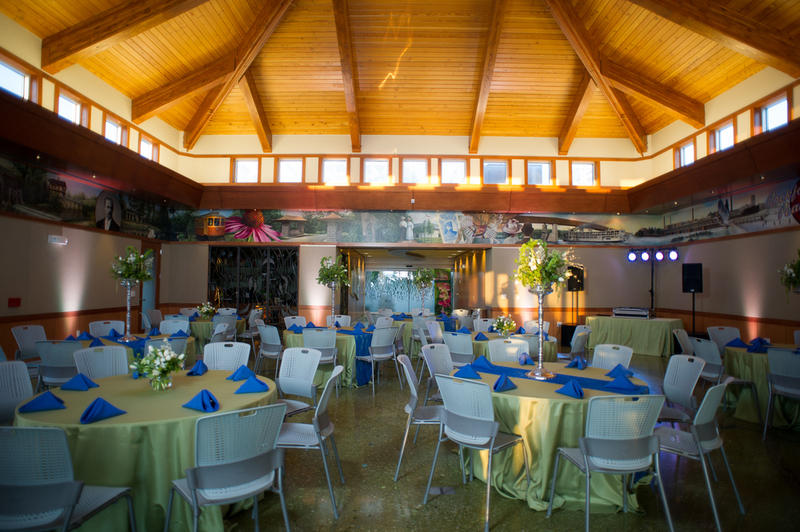 With space to accommodate 125 people, the visitor area serves as a great location for small weddings, receptions, and catered events. All package rates include a photography permit; additional tent and AV equipment fees may apply. Additional time in the exhibition area available for $200/hour resident or $250/hour non-resident. Package includes: tables and chairs, 1 hour in exhibition area, Atrium lobby (5:00 -11:00 p.m.) Meeting room (5:00 - 11:00 p.m.), 112 guest maximum. Saturdays & Sundays: 5:00 - 11:00 p.m.
Package includes: 1 hour in exhibition area/Riverview Terrace or the atrium lobby immediately following closing hours, 1 hour in meeting room immediately following closing hours, 112 guest maximum. Package includes: tables and chairs, 1 hour in exhibition area, Atrium lobby (6:00 - 11:00 p.m.), meeting room (6:00 - 11:00 p.m.), 112 guest maximum. Package includes: 1 hour in exhibition area, chairs, 20 guest maximum.